What's the problem with Temperature Control? I see people all over the Internet - on forums, YouTube, Facebook, Instagram - whinging on about problems with Temperature Control. I have to admit, the whining has put me a bit out of sorts! Why? Simple, really. Temperature control is really quite simple, and these folks are carrying on as though they're having to learn advanced calculus. Water boils at 212 F or 100 C.
Cotton burns at 420 F or round 215 C.
Some wires increase in resistance at a known rate when heated (that's TCR, folk... Temperature Coefficient of Resistance). A chip in the device knows what that resistance increase is, rapidly reads the resistance of the coil and alters the amount of power applied to the coil to keep it from going over a preset limit. Simple, right? We don't even need to know math! We need to know what temperature we want to vape at, what wire our coil is made of, and what our mods will work with. If it's Ni200, use an Ni200 mode (usually just called Ni). If it's a Titanium coil, use Ti mode. If it's 316L Stainless Steel (the most common), use SS mode (which most devices are tuned to 316L). If the device does not support Ti or SS, don't use it in TC mode. Note that the first numbers are the numbers used on the eVic Mini VTC. The numbers in parenthesis are the actual TCR values used on devices like the SMOK XCube II. Check the device manual to determine the correct method for entering TCR values, enter the TCR values, install an atomizer built with the appropriate coils, vape. Oh, sure, it's difficult to understand TCR, right? Why does it have to be understood? The mod handles it. If the mod does not handle it correctly, don't use it. If the vape is too hot or the coils are burning, don't use it. The device still has a wattage mode, or Ni or Ti modes. use them instead. If the Ni or Ti doesn't work correctly, don't use it, either. Know and use Ohm's Law! But they haven't figured out TCR. Ha! Really? Have they even looked at the Ohm's Law wheel? So, Amps times Resistance equals Voltage, Voltage divided by Resistance equals Amperage, and Voltage divided by Amperage equals Resistance. Let's do a real world example... say .5 Ohms... And, for grits and shiggles, let's say we're using a fresh battery or a regulated mod at 4.2 Volts. We always need two known values. But, really, it only adds one variable, Watts. 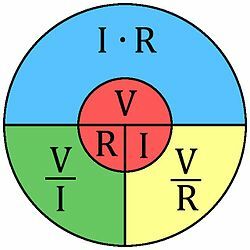 Looking at the simplest equations around the wheel we find that Watts divided by Amps squared equals resistance, Watts divided by Amps equals Voltage, Watts divided by Voltage equals Amps, and Volts times Amps equals Watts. The worst bit of math was squaring 4.2 (17.64 if there's no calculator about). Some wires have a known, stable resistance curve that increases as the temperature increases. The temperature increases as voltage is put to the coil. Ergo, the temperature and the resistance can be said to be in lock step. The DNA chip takes this a bit further by allowing the end user to map out the a portion of the curve in steps. Really, it is a curve, but the curvature is slight enough that when working with a device that only offers ten-degree Fahrenheit increments, the difference will be piddly. It's usually expressed R1 is in ohms at room temperature, R2 is resistance at operating temperature in ohms, T1 is the room temperature in degrees C and T2 is the operating temperature in degrees C. Let's take the most common TC wire, Nickel 200 or Ni200 and break it down. The mod is constantly reading the coil and, with all the algorithms in place and functioning correctly, it knows to reduce or cut the power when the coil reaches .16 Ohms to prevent the cotton from singeing. The point is, if it was even possible to wade through that, the average vaper does not need to know how to do this. The average vaper needs to know how to hold down series of buttons in a series of clicks and press up and down. If simpler still is desired, steam-engine.org has an outstanding calculator that will do everything except actually build the coil! So, please either use it and thank the vaping elite that have figured it all out in advance, or don't. Just don't whine about not knowing what it is... at least not until a little research has been properly performed. *Never, ever, ever, ever actually do this! While you put it far more eloquently than I ever could, I have often wondered the same thing when I see people saying they don't want to venture in to TC yet, as if it's some bold new frontier full of pitfalls. In a way, it's really no different than VW mode. Instead of making sure you don't exceed the recommended wattage of your kanthal coil, you just have to make sure you're using the proper wire. Instead of starting at a low wattage and increasing to find your sweet spot, you start at a low temperature and increase to find the sweet spot. I suppose it's all about what you're used to. I look at unregulated mech mods the same way as some people look at TC. I know the math isn't that hard, but I don't want to take the time to research and learn everything just yet. Soon, though. I feel the mech mod bug coming. Well done! Thank you for taking the time to do this. I think this should be a must read for vapers. My issue is I can't get stainless 316l to work unless it's just simple wire. Anything bigger (fused clapton, caterpillar, staple staggered, even basic clapton) and it doesn't work in temp control. That's over many different devices including a DNA 75 and a DNA 250! Yeah same here. I've even tried Claptons with SS cores + SS wraps and carefully removed the weak wire from the leads so they are bare. There's no reason to have to do this and it doesn't make sense. Other people build and vape TC Claptons all the time but i just can't make it work. Some mods are tuned to read simple wires. Some are tuned to read complex wires. That sounds odd, but I have found it to be true. Joyetech boards are so finicky, they kick me out of TC when I use SS316L Claptons, but my Sigeleis purr right along. Which mods are you using?